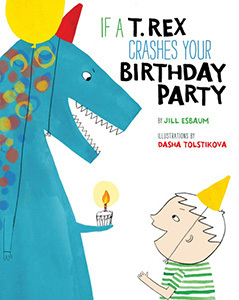 This is the story of what one may think will happen if a T. Rex attends your birthday party, what will REALLY happen, and the touching outcome in spite of it all. From his inability to play in the bouncy house (giant nails do tend to poke holes in things) to his problems with hitting the piñata with the abnormally short bat (which is actually regular size but those tiny arms can pose a problem), T. Rex will attempt to have fun but will probably be angry most of your party. His anger will lead to excessive roaring and unless you're handing out shooter's muffs in lieu of a party hat, I would envision headaches as a parting gift. He'll have bad breath, and still eat most of your cake. He'll refuse to clean up his mess, but he'll still play with your presents before you even get to because really, shiny toys...who can resist! His manners are lacking, his size makes every entrance something to remember, but when all is said and done, his very presence will have brought cheer to your day...and his heartfelt farewell would make anyone smile. In short, a fun story about that "what if" most kids dream of for some birthday or another filled with illustrations that delight and enchant. You'll see where our little birthday boy is coming from with everything he shares, but that tender moment near book's end will be the icing on the last birthday cupcake...the sweetest treat because it was shared with love. Jill Esbaum is the award-winning author of many picture books, including I Am Cow, Hear Me Moo! and I Hatched! (both Penguin). She also enjoys writing a variety of nonfiction books for National Geographic Kids, including the popular Angry Birds Playground series. Jill lives on a farm in IA. Learn more at jillesbaum.com and picturebookbuilders.com. Dasha Tolstikova is an illustrator whose work has appeared in The New York Times, Wall Street Journal, and New Yorker. Her picture book The Jacket (Enchanted Lion Books), written by Kirsten Hall, was named a New York Times Notable Book of 2014. She wrote and illustrated the graphic novel A Year Without Mom (Groundwood Books). She lives in Brooklyn, NY. Learn more about Dasha at dashatolstikova.com. Special thanks to Ardi at Sterling Publishing Company for the copy for review. (THANKS!) For more information on this title, the author, the illustrator, or the publisher, feel free to click through the links provided above. This title just hit store shelves today via Sterling Children's Books, so be on the lookout for it in a bookstore or on a virtual shelf of your choosing! Be sure to get your copy of the T. Rex Party Kit, a FREE DOWNLOAD over on the author's site for more dino-tastic fun! Well I certainly know several little boys who would love it if a t-rex was to crash their birthday party.